Using AWS Lambda will enable us to scale to serve millions more who need financial help. Financial Engines is the largest independent investment advisor in the United States, providing technology-enabled portfolio-management services, financial planning, and investment advice to millions of people nationwide. Founded in 1996 to help 401(k) participants manage their retirement accounts, Financial Engines is the largest independent investment advisor in the United States in terms of assets under management. It offers financial help to more than nine million people across 743 companies (including 150 of the Fortune 500) and represents $1.18 trillion in retirement assets. The company also manages more than one million individual investment accounts worth more than $160 billion. Unlike traditional investment advisors, Financial Engines scales its business by using computational “engines” to automate portfolio management combined with access to human advisors. “Using technology, we can manage over one million clients with fewer than 500 financial advisors—a ratio significantly better than traditional financial-services companies,” says Paul Gibson, principal system architect at Financial Engines. As demand for its services grew, Financial Engines wanted to improve the scalability of its core engine component—the integer programming optimizer (IPO). Integer programming is a type of linear programming used to compute mathematical optimization or feasibility. The IPO server uses a native, third-party solver library to perform the calculations used to evaluate and optimize investment portfolios. Financial Engines chose the Amazon Web Services (AWS) serverless computing platform to run its IPO engine. Serverless computing enables Financial Engines to run the IPO engine without provisioning or managing any servers. The company replaced 50 IPO servers running in 21 different environments with four Lambda endpoints that handle all the traffic. Each time an IPO request is received, a Lambda function is triggered and runs the IPO code. Since the functions are stateless, AWS Lambda can run as many copies of the function as needed in parallel, dynamically allocating compute capacity to match the rate of incoming requests. “We see spikes of up to 1,000 requests per second, with an average duration of 100 milliseconds—which is about 100 concurrent executors,” says Gibson. To monitor Lambda processes, the company uses Amazon CloudWatch (CloudWatch) and ingests the CloudWatch logs into Splunk for analysis. “The performance of AWS Lambda is more predictable and stable than running the IPO server on premises,” says Yavorskiy. The AWS Lambda function model makes it a natural fit for building microservices. Running the IPO as a microservice on AWS Lambda with its own continuous integration/continuous delivery (CI/CD) pipeline is a major step toward breaking up the company’s monolithic architecture. Financial Engines has 15 additional microservices in production that it expects to build on AWS. 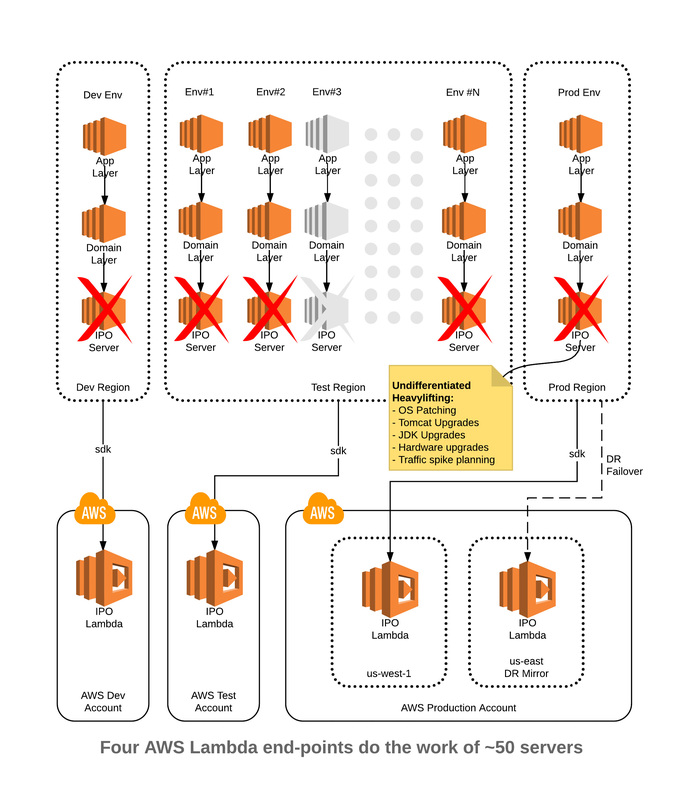 Learn more about serverless computing on AWS.